Monday 22nd April 2013. The latest House Rebuilding Cost guide, published annually by the Society of Chartered Surveyors Ireland (SCSI), shows that national average house rebuilding costs have stabilised, and are now 24 per cent lower than they were in 2008. The SCSI said that as many insurance company automatically index-link home insurance premiums, homeowners should check to ensure that their rebuilding costs are adequate and in line with current figures. By doing so, they could avoid over-paying on their premiums. Andrew Nugent, Chairman of the Quantity Surveying Professional Group of the SCSI said it was good news for homeowners that rebuilding costs had stabilised. “The stabilisation in rebuilding costs is good news for homeowners and adds another element of certainty in terms of budgeting for the year ahead. The key for homeowners is to check that their ‘sum insured’ on their home insurance premium is in line with this year’s reinstatement figures available from the Society – to ensure that they are not over-paying or under-insuring for the costs of rebuilding their home in the event of a catastrophe”. Commenting on the common practice of index-linking home insurance premiums on an annual basis which causes them to increase, Mr Nugent said homeowners should ensure that the stabilisation in rebuilding costs this year is reflected in their insurance premiums, which, all things being equal, should stabilise too. He attributed the higher reinstatement costs in Dublin in comparison to the rest of the country to higher labour costs in the capital. The stabilisation follows several years of price falls which meant homeowners could look forward to pro-rata reductions in house premiums. Mr Nugent said the most important thing for homeowners is to make sure they are neither overpaying their insurance premiums or underinsuring their homes and he reminded homeowners that they can check their house rebuilding costs using a variety of resources available for free from the SCSI. 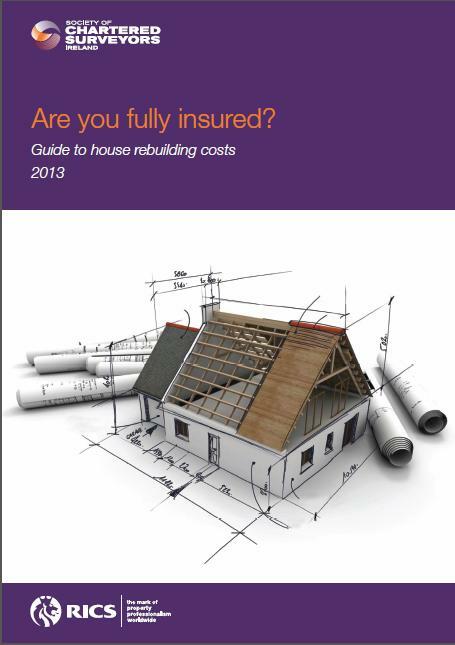 Homeowners can check their rebuild costs are reflected in their insurance premiums by downloading the 2013 House Rebuilding Cost Guide from the SCSI website here or they can use the SCSI’s Online House Rebuilding Cost Calculator here. Alternatively they can download the SCSI’s House Rebuilding Cost Calculator App from the iPhone and Android App stores. The costs included in this guide are a guideline to the MINIMUM value for which you should insure the structure of your house. Applying these rates to the area of your house will give you a base, which you should add to in order to cover other costs, such as boundary walls, garages, fitted kitchens, etc. It is sometimes thought that the market value of the house, in other words the price achieved when the property is sold on the open market, is the value for which the property should be insured. This is, however, irrelevant as the market value of a property generally has little relationship to the reinstatement value. The costs in this guide are intended to cover typical, speculatively built estate type houses in Dublin, Cork, Galway, Waterford and Limerick, which were built since the 1960s.